A huge crowd turned out on Sunday, October 26, for Urban Harvest 2003, presented by Slow Food USA and the French Culinary Institute. The four-hour food and wine tasting extravaganza was a schizophrenic affair, combining samplings of some of the best artisanal foods in the Northeast with wines from a micro-region in Northern Italy. 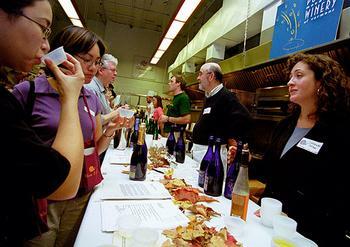 The public and private spaces of the French Culinary Institute were transformed into a series of specialized rooms packed with cheese producers, apple farmers, cider makers, and hungry attendees whose eagerness to sample the food was only hindered by the long lines that wound throughout the cooking school. The Wine and Dine Room, in the dining room of L’Ecole, the French Culinary Institute’s restaurant, showcased 17 wineries from Valtellina, a wine-producing area in Northern Lombardy, close to Italy’s border with Switzerland. According to the glossy brochures distributed at the event, the region proclaims itself “Italy’s biggest viticulture terraced mountainous area." All of the wines from Valtellina are made from the Nebbiolo grape, and each of the wineries featured two or three different wines. The most interesting was the Sforzato, a wine made from Nebbiolo grapes that have been air-dried off of the vine before extracting the juice. Starting off at the first table to taste the wines of Casa Vinicola Triacca, I waited in line, elbow-to-elbow, for my turn. The queue for the wine-tasting was slow going, and I ended up sampling wines from only a handful of the wineries before giving up and moving on. The best were from Casa Vinicola Fay and Casa Vinicola Plozza. Seeing that this was going to be a very long, hard slog, to paraphrase the Secretary of Defense, I headed to the “back of the house” of L’Ecole, where the kitchen was transformed into The Nosh Room, featuring samples of bagels and knishes. The circuit continued into the Urban Garden Room, which highlighted produce from community gardens and community supported agriculture. The notion of eating food grown directly in New York City is appealing, but the tasting was, unfortunately, meager—torn greens and olive oil on a toasted slice of baguette. On to The Big apple Room, featuring heirloom apples, including sweet, tart russets anointed with artisanal honey from Beehive Bee Products, and then Ciderville, a gauntlet of apple ciders, wines, ice wines, brandies, and champagnes (pictured above). Through the back corridors of the cooking school, up the stairs, and into The Cheese Cave for the next stop. This room featured excellent raw cow and sheep milk cheeses from cheese-makers based in Vermont, New Jersey, and Connecticut. There were more crowds to battle in The Cheese Cave, but I was able to taste a few before heading to the amphitheater for a special seminar. Urban Harvest 2003 featured a panel discussion entitled “The City as Market: Urban Foraging for Artisanal Products," including Hilary Baum, Director of Baum Forum, Zak Pelaccio of Williamsburg's Chickenbone Café, Rob Kaufelt of Murray’s Cheese Shop, Rachel Schneider of Hawthorne Valley Farm, and Dave Size of Blueberry Love Foods. Although the seminar was ostensibly about how to locate the kinds of handcrafted foods that were being sampled throughout the event, much of the discussion was about the business of making artisanal foods and new trends in the industry. In the course of this discussion, a debate emerged about the semantics of what language should be used to wrap around the foods that were being tasted at this event. Mr. Kaufelt rejected the artisanal label as vague, overused, and even confusing for the consumer. He indicated that his term of choice is “farmstead” to describe cheeses that have been made with milk from the same farm where the cheeses are produced. Ms. Schneider described her farm, which produces cheese and yogurt, as "biodynamic," but did not define the term. Instead, she referred the audience to Demeter, the organization that certifies farms as biodynamic, for more information about the label. Bringing the discussion back to the topic of urban foraging (or, "where you find this stuff"), Mr. Pelaccio offered up his own term, “urban sustainability,” a “buzzword” he said he coined to describe Chickenbone Café's commitment to foraging in the outer boroughs and supporting the food products of New York’s ethnic neighborhoods. With enormous enthusiasm, Mr. Pelaccio praised the traditional methods that go into making kielbasa at a Polish butcher shop in Greenpoint, Brooklyn, and he encouraged the audience to seek out such local purveyors, which he acknowledged may not use organic materials to create their products, but employ methods of production based on long-standing traditions. In a final push for his urban sustainability paradigm, Mr. Pelacio left stacks of business cards from some of his favorite ethnic restaurants in the back of the room. The cards were quickly snatched up when the panel ended. By the time the seminar let out, the event was starting to wind down. I retraced my steps and went back to The Charcuterie Room, which I had missed on the way to the seminar. The tables were closing up, but I was able to taste excellent, peppery pastrami hailing from Zingermans in Ann Arbor, Michigan. From there, I made it to the final stop on the tasting tour, The Willy Wonka Room, which featured sweets, including amazing maple candies from Deep Mountain Maple. The dark, rich candies came in several varieties, including pecan, coconut, and ginger. I left the building with a handful of them, savoring the crystallized, melt-in-your-mouth treats as I headed home.